Tonight is election-eve in my neck of the woods. 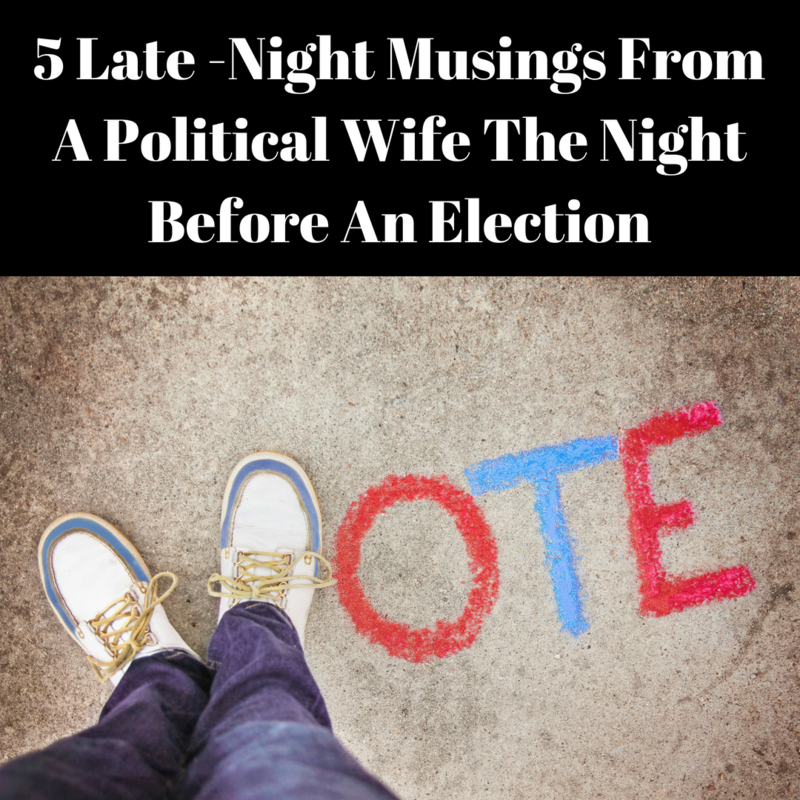 That is pretty much a holiday if you are a political wife. At this point in the campaign, most political spouses have either been a solo-parent or living with someone who is spun so tight you think they will snap or have a stroke. Fear not (some sort of) normalcy is finally on the horizon. Apparently, your body (mostly) replaces itself every 7-15 years. However, I feel like a completely different person than I was that last election-eve only four years ago. 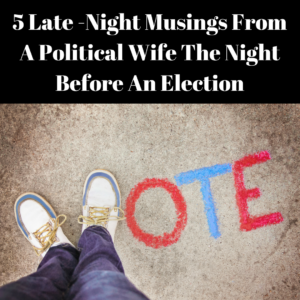 So much has happened since the LAST election night (leadership races, scandals, more leadership races . . .). As I sit here 4 years older and a whole lot wiser, what have I learned? 2) Horrible things will happen and might break you down. Then you will rebuild. I promise. Message me; I will help. 3) Forgive, but don’t forget. Bitterness will not make you a better person or your life better. But learn from those who have you hurt you. 4) You really can’t trust anyone except a therapist. You should probably get one. 5) Laugh. The world is crazy and very few things make sense. Take comfort that this will probably be the only constant. Good luck to all who are running in this election and their families. My door is open to you.